BERLIN 2005 - The 2005 SWATCH-FIVB Women's and Men's Beach Volleyball World Championship powered by Smart (www.beachvolleyball2005.com) will take place on the Schlossplatz June 22-26. The 48 men's and 48 women's teams will compete for the medals as US$1,000,000 will be distributed. Olympic gold medallists Emanuel Rego and Ricardo Santos of Brazil and Misty May and Kerri Walsh of the United States are expected to compete in the fifth annual SWATCH-FIVB World Championship as both teams captured the world titles in 2003 in Rio de Janeiro, Brazil. Brazil has claimed six World Championship gold medals, including three men (1997, 1999 and 2003) and three women (1997, 1999 and 2001). Mariano Baracetti and Martin Conde of Argentina captured the 2001 men�s title in Austria. Emanuel claimed the 1999 world title with Jose Loiola in France while Guilherme Marques and Para Ferreira captured the 1997 crown for Brazil in Los Angeles. May and Walsh denied the Brazilian women their fourth-straight world crown by defeating Adirana Behar and Shelda Bede in the 2003 finale. Adriana and Shelda won the 1999 and 2001 for Brazil after placing third in the 1997 World Championships after losing to eventual champions Sandra Pires and Jackie Silva in the semi-finals. A total of 449 teams from 41 countries have competed in the first four SWATCH-FIVB World Championships where over US$2.5-million has been distributed. 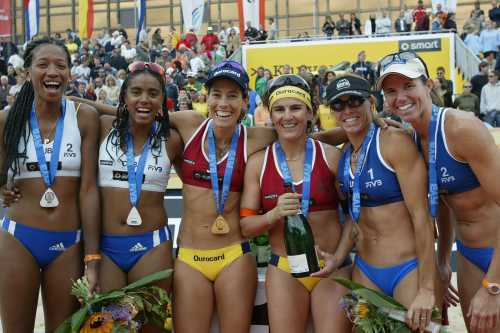 Women � The women�s SWATCH-FIVB World Tour returns to Berlin for the fourth-time as the 2005 stop will be part of the SWATCH-FIVB World Championships. Host Germany will be looking for its first podium finish for its women�s teams as Suzanne Lahme and Danja Musch placed fourth in the 2004 Berlin stop. 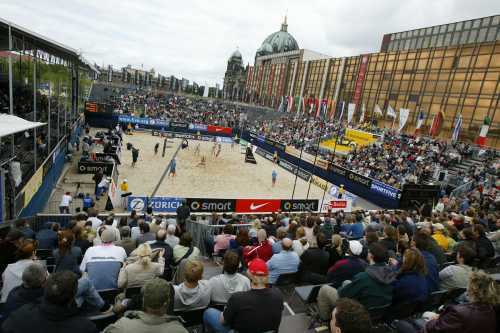 Men - The men�s SWATCH-FIVB World Tour returns to Berlin for the 10th-time as the 2005 stop will be part of the SWATCH-FIVB World Championships. 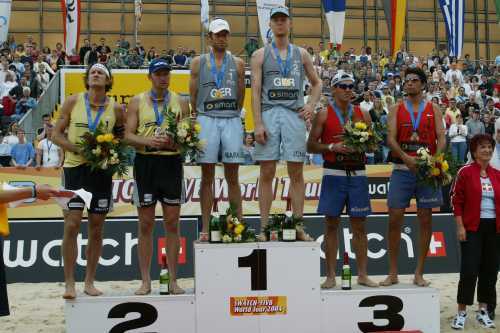 Host Germany will be looking a repeat of the 2004 Berlin stop when Markus Dieckmann and Jonas Reckermann won the gold medal. The 2004 Berlin stop also marked the first-time that Brazil did not earn a podium spot as Olympic Champions and 2003 World gold medallists Emanuel Rego and Ricardo Santos dropped the bronze medal match to Mariano Baracetti and Martin Conde of Argentina, the 2001 FIVB World Champions. October 7-12, 2003 Rio de Janeiro - Semi-Finals - Misty May/Kerri Walsh, United States (1) def. Natalie Cook/Nicole Sanderson, Australia (5), 19-21, 21-19 and 18-16 (61), Shelda Bede/Adriana Behar, Brazil (3) def. Annett Davis/Jenny Johnson Jordan, United States (7), 21-16 and 21-16 (40), Bronze Medal - Natalie Cook/Nicole Sanderson, Australia (5) def. Annett Davis/Jenny Johnson Jordan, United States (7), 21-16 and 21-17 (35), Gold Medal - May/Walsh, United States (1) def. Shelda/Adriana, Brazil (3), 21-19 and 21-19 (40). August 1-4, 2001 Klagenfurt, Austria - Semi-Finals - Adriana Behar/Shelda Bede, Brazil (1) def. Eva Celbova/Sona Dosoudilova, Czech Republic (12), 21-15 and 21-16 (37), Sandra Pires/Tatiana Minello, Brazil (3) def. Barbra Fontana/Elaine Youngs, United States (2), 21-19, 13-21 and 15-13 (61), Bronze Medal - Celbova/Dosoudilova, Czech Republic (12) def. Fontana/Youngs, United States (2), 21-17 and 21-19 (39), Gold Medal - Adriana/Shelda, Brazil (1) def. Pires/Minello, Brazil (3), 21-16 and 21-18 (39). July 19-24, 1999 Marseille, France - Semi-Finals - Annett Davis/Jenny Johnson Jordan, United States (8) def. Liz Masakayan/Elaine Youngs, United States (13), 15-11 (50), Shelda Bede/Adriana Behar, Brazil (1) wo by forfeit over Sandra Pires/Adriana Samuel, Brazil (3), Bronze Medal - Masakayan/Youngs, United States (13) won by forfeit over Pires/Samuel, Brazil (3), Gold Medal -Shelda/Adriana, Brazil (1) def. Davis/Johnson Jordan, United States (8), 15-11 (30). September 10-13, 1997 Los Angeles - Semi-Finals - Lisa Arce/Holly McPeak, United States (1) def. Karolyn Kirby/Nancy Reno, United States (12), 12-4 and 12-9 (77), Sandra Pires/Jackie Silva, Brazil (3) def. Shelda Bede/Adriana Behar, Brazil (2), 12-11, 4-12 ad 12-3 (116), No Bronze Medal Match, Gold Medal - Pires/Silva, Brazil (3) def. Arce/McPeak, United States (1), 12-11, 1-12 and 12-10 (89). August 1-5, 2001 at Klagenfurt, Austria - Semi-Finals - Mariano Baracetti/Martin Conde, Argentina (4) def. Rob Heidger/Chip McCaw, United States (4), 21-16 and 21-16 (44), Jose Loiola/Ricardo Santos, Brazil (10) def. Jorre Kjemperud/Vegard Hoidalen, Norway (6), 29-31, 21-19 and 15-12 (69). Bronze Medal - Kjemperud/Hoidalen, Norway (6) def. Heidger/McCaw, United States (18), 21-16 and 21-14 (37), Gold Medal - Baracetti/Conde, Argentina (4) def. Loiola/Ricard,, Brazil (10), 25-23, 12-21 and 20-18 (69). July 20-25, 1999 at Marseille, France - Semi-Finals � Emanuel Rego /Jose Loiola, Brazil (2) def. Javier Bosma/Fabio Diez, Spain (8), 15-11 (53), Paul Laciga/Martin Laciga, Switzerland (6) def. Para Ferreira/Guilherme Marques, Brazil (3), 15-11 (56), Bronze Medal Para/Guilherme, Brazil (3) def. Bosma/Diez, Spain (8), 15-7 (35), Gold Medal - Emanuel/Loiola, Brazil (2) def. P. Laciga/M. Laciga, Switzerland (6), 15-8 (50). September 10-13, 1997 at Los Angeles - Semi-Finals -Guilherme Marques/Para Ferreira, Brazil (9) def. Paulao Moreira/Paulo Emilio Silva, Brazil (4, Q1), 10-12, 12-9 and 15-13 (136), Canyon Ceman/Mike Whitmarsh, United States (3) def. Dain Blanton/Kent Steffes, United States (2), 12-5 ad 12-8 (68), No Bronze Medal Match, Gold Medal - Guilherme/Para, Brazil (9) def. Ceman/Whitmarsh, United States (3), 5-12, 12-8 and 12-10 (90).